2016 was record-setting … and threats aren’t likely to subside in 2017. Let’s reflect on what happened this year and learn about emerging threat landscape trends. A solid understanding of the threat landscape will help you better formulate your defensive strategy and prioritize security initiatives for 2017 and beyond. 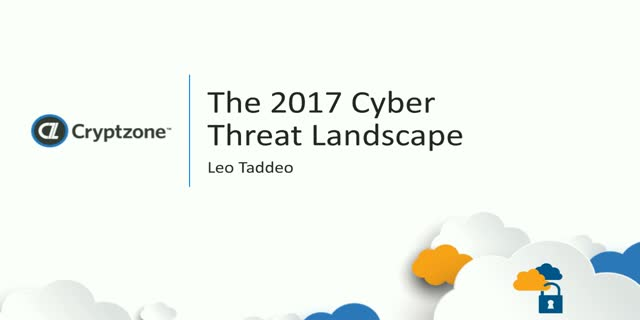 This webinar will feature Leo Taddeo, who is uniquely qualified to present his thoughts on the ever-changing threat landscape. Currently Chief Security Officer (CSO) for Cryptzone, a provider of dynamic, context-aware network, software-defined perimeter based security solutions, Leo is former Special Agent in Charge of the Special Operation/Cyber Division of the FBI’s New York office. Leo is a frequent cybersecurity source for business, IT security and global news outlets, such as: Bloomberg, CNBC, CSO Online, Dark Reading, Fortune, New York Times, Washington Post and more. Join the discussion on December 14th!